Please join us for two hours at one of our collection days throughout the year. 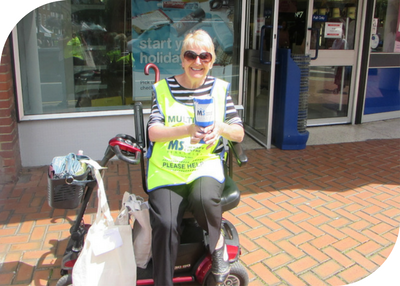 In 2017 our collecting team raised over £30,000. Will you join us this year? As well as raising money (a two hour slot can raise enough for a treatment or even two on a generous day), it will also be raising all-important awareness of the Centre and the help it can provide. We have collections throughout Berkshire and the surrounding areas so there is likely to be one near you. We have some collection tins and boxes in need of a home - they live on a diet of loose change and promise to be well behaved. Whether it is on a shop counter or a cardboard box at home, please consider homing one. You will be surprised how quickly loose change adds up and we can turn it into support for our members. If you are collecting change at home and pay tax, please read if you are eligible for Gift Aid as your donation will go 25% further.